Why should you open a casino account at Betfred? Betfred Casino currently has three promotions available: a 100% deposit match welcome offer, an alternative high-roller bonus, and a comp system that lets players earn points that convert into cash prizes. You can qualify for these offers when you register a new account at Betfred. Click here to open your new Betfred account! Open an account at Betfred and enjoy everything Betfred has to offer – sports betting, poker, instant games, live dealer casino, bingo, lotto, mobile games, and of course one of the best online casinos with a massive game selection. The popular £200 welcome bonus is spread out over your first 3 deposits, so you do not have to make an initial deposit of £200 to receive the maximum bonus! The Betfred welcome bonus ALSO applies to the Betfred Mobile Casino! In addition to your welcome bonus, earn extra rewards with Betfred comp points, or apply to the Betfred VIP Club for enormous benefits geared towards bigger players. Up to £200 in bonus money over your first 3 deposits! Click here to join the Betfred Casino! The welcome bonus applies to any person who registers a new account with Betfred Casino for the first time. Claiming the bonus simply involves making at least one deposit of at least £5, but the bonus is spread out over three stages, which require three separate despots of at least £5 each. The bonus for the first deposit is a 100% match for up to £100. The bonuses for the second and third deposits match 50% of the deposit amounts up to £50. To claim the maximum bonus amount, one would have to deposit £100 three times. 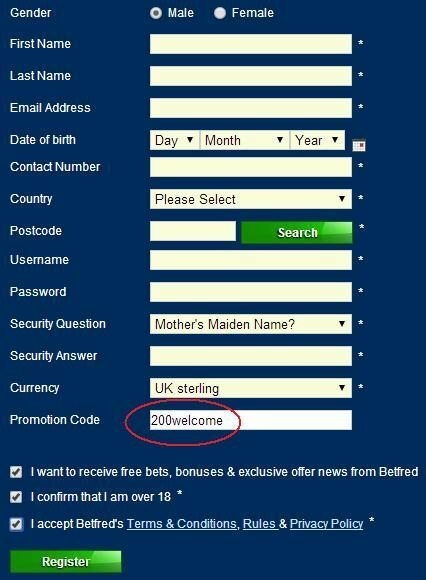 The proper Betfred promotion code should automatically fill itself in when you visit the Betfred Casino. These welcome bonuses do not require any other steps or other user action. The casino will credit the bonus to your account automatically as soon as the deposit clears. Note, however, that you must confirm acceptance of the bonus terms. This mechanism is in place so that clients who do not want the bonuses can simply ignore them. Clients have three days to accept a bonus, and any bonus money not wagered within 14 days of acceptance will expire. Bonus recipients must meet a wagering requirement before any winnings derived from the bonus become available for withdrawal. The requirement is 40 times the bonus amount. Therefore, if one were to claim the maximum bonus amount, the total wagering requirement would be £8,000. There are additional stipulations. One may not apply more than 20 percent of the total stage bonus, which amounts to £20 or £10 depending on the stage, to a single wager. Furthermore, not all games contribute fully to the wagering requirement. While slot machine wagers contribute 100 percent, keno bets contribute only 50 percent and blackjack wagers contribute only 10. Below is how wagering on games will contribute towards meeting the 40x requirement. The high-roller bonus is an alternative to the welcome offer for new clients who are willing to make a first deposit of at least £1,000, and it has a flat value of £500. The user need not take any special action. Simply register a new account and then make the necessary deposit. The high-roller bonus will automatically supersede the standard welcome offer and be sent to the user account. Note that as with the standard welcome bonus, the user must confirm acceptance of the high-roller bonus with three days and the expiration period of 14 days is not increased despite the larger bonus amount. In addition, the wagering requirement, bonus restrictions and contribution limits are the same for the high-roller bonus as they are for the standard welcome bonuses. All Betfred clients are automatically enrolled in a casino loyalty program that awards comp points. Comp points convert into cash prizes, and those cash prizes are actual cash not bonus money, which means that the client is free to do with the money as he or she sees fit as soon as it is awarded. New clients begin at a base level and then eventually graduate to Bronze as they wager more. Additional loyalty tiers include Silver, Gold, Platinum and Diamond. Tier is important because it dictates the number of comp points needed to purchase £1 in cash prize. While the conversion rate for new uses is 100 comp points to £1, the conversion at Diamond is 70:1, which is a substantial difference. Note that new users must have accrued at least 1,000 comp points before claiming a cash prize, but that minimum is adjusted based on tier. In other words, a client at the Diamond tier need have accrued just 700 points in order to claim a cash prize. All players, regardless of tier, earn comp points at the same rate, which is one comp point per £10 wagered. The casino also hosts promotions that increase comp point earnings. For instance, Casino Game of the Week is a regular promotion that highlights a particular game, usually a game new to the casino, and bets on that game earn one comp point per £5 wagered. On such promotions, there is no limit to the number of times a player can take advantage of the increased rate. Click here to sign up to the Betfred Casino today! If you are interested in taking advantage of the Betfred free sports bet offer – also available to new Betfred clients – you can find the details on that Betfred promotion code here.